Are you a Daring Entrepreneur? An audacious person fueled by wild passion and sheer determination. 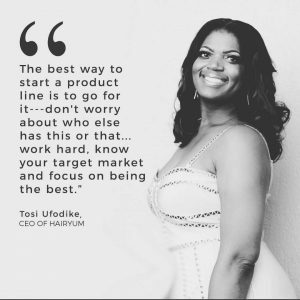 Rarely bothered by sleepless nights, she keeps her engine running on pure adrenaline and a commitment to doing good (serving her target market) and doing well (profiting big-time). Never to be confused with an ordinary small business owner, she’s defying the odds, making money and building an empire. As a woman owned business we love meeting, promoting and supporting other incredible women who are working to grow their small businesses as well. For we all know there is never a right time, the time is NOW. Are you ready to gain some major exposure? Only $29.99 (Limited Spots) or with an exclusive Podcast Interview ($49.99). Get Featured on our Dare 2 Aspire Instagram, Facebook, and Twitter as a Daring Entrepreneur. Get Promoted in our newsletter and gain access to speak at one of our Dare 2 Aspire Conferences. One 30 Min Coaching Session with Tosi Ufodike via phone. 10% discount off Dare 2 Aspire Conference Registration Fees. Click HERE now. Nigeria: Pay N3,000 Naira to GT Bank Account: 0451337963. Kindly send proof of payment to: dare2aspire2012@gmail.com. Once you complete the form, we will get back with you within 72 hours. Please only complete the form once. We have a high number of requests.